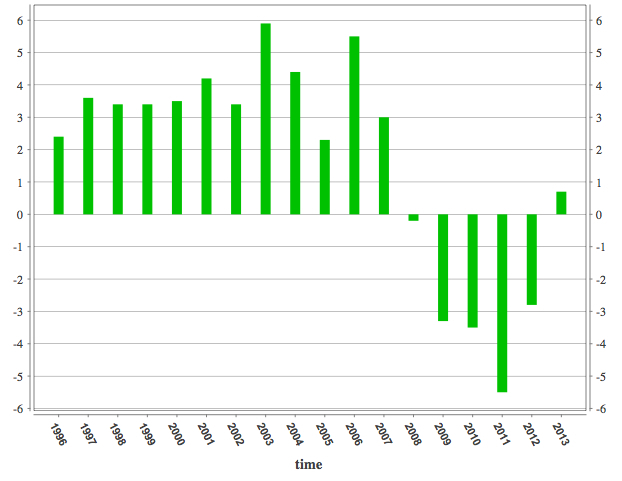 In my last post, I outlined the IMF’s abysmal track record in charting Greece’s GDP growth path. The IMF’s initial Stand-By Arrangement (SBA) programme was expected to produce a single-digit dip in GDP followed by a rapid recovering. In reality, GDP has crashed by over 20% and we see no sign yet of any expansion. 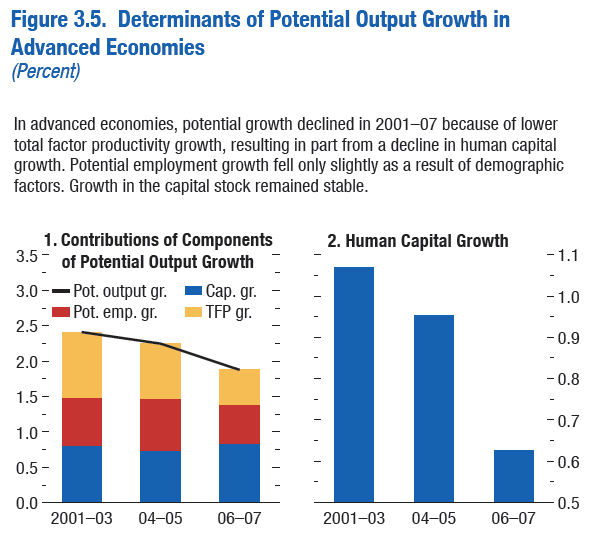 Note that economic recoveries from recessions usually have two components: 1) the gradual removal of the gap between potential output and actual output as idle capital and labour is gradually put back to work, and 2) a pick up from long-term structural productivity gains as new technology becomes available. The former can be thought of as a short-term cyclical component of growth and the latter as a long-term structural component of growth. The IMF certainly wasn’t responsible for Greece’s economic downturn; indeed, Greece only entered an IMF programme (jointly orchestrated with the European Commission and the European Central Bank—the so called Troika) through a Stand-By Arrangement (SBA) agreed in May 2010, 18 months after the collapse of Lehman Brothers in September 2008 (the fulcrum point for the credit crisis). Nonetheless, the IMF’s track record in both evaluating Greece’s economic risk before trouble hit and in helping craft a set of coherent economic policies that would supposedly build the foundations for renewed growth has been abysmal. Unfortunately for the IMF, we have a ‘before and after’ comparison in the form of the last two Article IV Consultations (the IMF’s economic health checks) of Greece, the first conducted on July 2009 before the recession bit (here) and the latest conducted in June 2013 after all hell had broke loose (here). Staff projects negative growth in 2009 and 2010. Greece is feeling the downturn with some delay. Moreover, even with the staff’s weaker outlook relative to the authorities, Greece’s growth decline from peak to trough would still be milder than for the euro-area as a whole. The San Francisco Chronicle has a must-read article for anyone exposed to low-lying U.S. real estate (here). On my bookshelf is a wonderfully written book by science historian and physicist Spencer Weart called the Discovery of Global Warming. Via The Big Picture, I find that The American Institute of Physics is hosting a user-friendly hypertext accompaniment to the book that tells you everything you need to know about the discovery of global warming. Bjorn Lomborg is in the news again with an Op-Ed piece at the Wall Street Journal. Climate Science Watch does the debunking here. Lomborg, like Matt Ridley, appears to have open access to the Wall Street Journal’s pages. If you come to his writings with no background in the subject nor knowledge of primary sources, he appears persuasive. I must admit to having given a copy of “The Skeptical Environmentalist” to my mother as a Christmas present many years ago (before I saw the error of my ways). His arguments contain one part truthfulness, to one part falsehood to one part misrepresentation. At the end of the day, you have to rely on what mainstream climate scientists say about Lomborg’s views—which is that much of what Lomborg says is plain wrong. I recently came across the Weatherdem blog. My type of blog: solid, concrete analysis coupled with a call to action. I am currently trying to get my head around the IPCC’s new Representative Concentrations Pathways (RCPs)—the CO2 emission projections commensurate with a certain level of greenhouse gas warming; Weatherdem has a good post explaining the emission paths here. The two Bretton Woods institutions have been missing in action when it comes to climate change. Fortunately, one now “gets it”. The World Bank’s “Turn Down the Heat” report released in November 2012 is a watershed. Even more encouraging is that the president of the World Bank Jim Young Kim has thrown his authority behind the awareness raising. This article by him in the Washington Post could not be more clear. And it’s personal: ‘My wife and I have two sons, ages 12 and 3. When they grow old, this could be the world they inherit. That thought alone makes me want to be part of a global movement that acts now.” Bravo. Now if only the IMF could get on board (it’s current coverage of climate risk is desultory). Greece as the Canary in the Coal Mine for Collapse? Much of the western media appears to view Greece as a morality play: hubris coming before a fall. But many of the elements that have brought Greece down have parallels in the larger economies: an ageing population, increased integration into the global economy, hollowing out of traditional industries, reliance on debt to sustain growth, dependence on increasing social transfers to offset inequality brought about by technological change and a widening energy import bill. Greece joined the EU in 1981 and the eurozone in 2001 (with the drachma abolished in 2002). This chart of Greece’s GDP growth rates from eurostat shows the sharp reverse in the country’s fortunes (note that the forecast rates for 2012 and 2013 currently look hopelessly optimistic). Moreover, latest data for 2011, suggest the final figure will come in at around minus 7%.